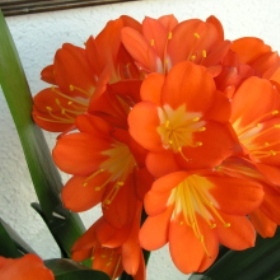 This South African native plant (also known as the bush lily) grows from a rhizome. In the wild it is found in the Eastern Cape Province, KwaZulu Natal and into Swaziland, where it grows in the leaf mould on the forest floor. C. miniata was collected by British explorers and botanists from the early nineteenth century onwards and was a feature of Victorian and Edwardian glasshouse ranges, although it does not require the steamy tropical conditions often maintained in them: it can tolerate temperatures down to 10C (50F). It makes a stunning house plant, but should be treated with care as all parts of the plant are toxic and can cause skin irritation.